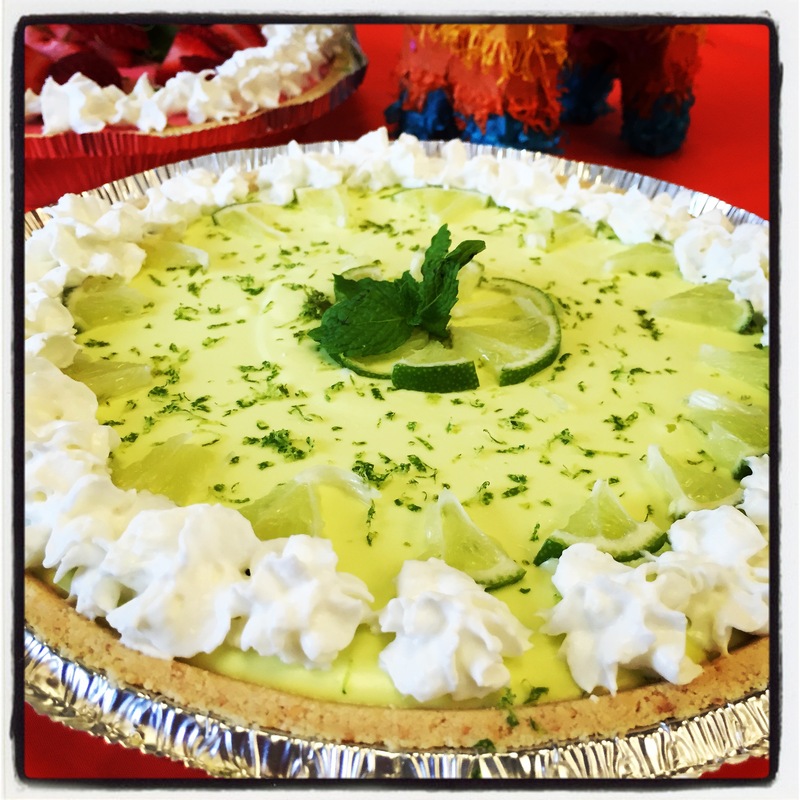 Cinco de Mayo – Margarita Pie, you say? Hola my friends! Happy Cinco de Mayo! If you work someplace fun, like I do (okay,…most days), you get to enjoy a fun fiesta pot-luck luncheon on May 5th. Me, I signed up for dessert and dusted off an old recipe for a “Margarita Pie”. Even my mouth watered at the memory of this light, tasty dessert. The recipe — technically for “Sunshine Pie” — came out of a Woman’s Day magazine from eons ago, and try as I might, I just could not find it online. So, I have taken to my keyboard to type it up for you. You can whip this up in about 10 minutes, and enjoy it in a couple of hours after it chills. While there is not a requirement for use of tequila in the Margarita Pie version, I said; Why not? I couldn’t come up with a reason, and am just going to say that it makes the pie that much better. Versatile, easy dessert that everyone will ask for! Quick and easy to make; prepare in about 10 minutes, chill for a few hours or overnight. Serves 8 (or more depending on slices). In a blender (I used my largest Ninja container), sprinkle the gelatin over the cold water; let stand for 1 minute. Pour the hot cream into the blender and process until gelatin is completely dissolved, about 1-2 minutes. Add the cream cheese, juice concentrate, sugar and vanilla; process until well blended (1-2 minutes). Pour into the crust; chill until firm. Garnish and serve! For the Margarita Pies: I swapped out 1/4 cup of Tequila for the cold water, and used 6 oz frozen Bacardi Margarita drink mix; regular Margarita flavor for one pie, garnished with fresh lime zest, thinly sliced and sectioned lime pieces, mint leaves and whipped cream. 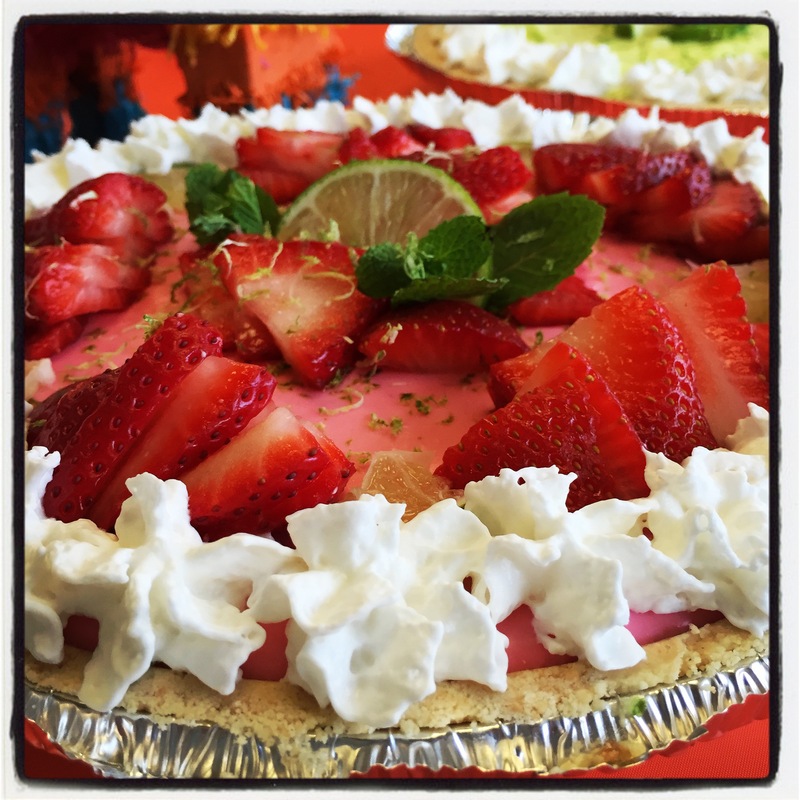 For the other pie I used Strawberry Margarita mix, then garnished with sliced strawberries, lime zest, mint leaves and whipped cream. I found “Shortbread” pre-made crusts to use for these. Add a few drops of food coloring if the blended mix is too pale; the pies pictured here all had a little coloring added. I also could not locate “6 oz” cans o frozen concentrate, so I estimated x% of the can depending on how big it was. This dessert recipe truly is so versatile… Make this pie with whatever flavor juice concentrate suits your menu! An orange juice blend concentrate – like Orange Mango Peach – garnished with mandarin orange sections is bright and sunny! Use limeade, or strawberry lemonade… or fruit punch! And, if you swap the water out for something more, …. exciting, perhaps… That’s up to you! Cut a slice, put your feet up and have a nice little vacation for your taste buds.. or a fiesta! Enjoy!